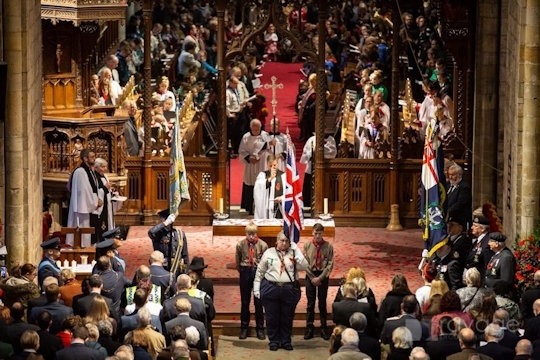 MANY events took place throughout the UK and Europe from 2014 to commemorate WWI and came to a climax in November 2018. Clerks & Councils Direct has published projects and events from councils up and down the country and there is a major roundup in the November issue with even more in January 2019. Projects continue to be reported in 2019. A digital project is helping to bring history to life in YATE in Gloucestershire. Anyone with a smartphone or tablet can tap into the history of local people who lost their lives during the First World War, using Quick Response (QR) codes that have been installed on a stone wall by the lychgate at St Mary’s Church, and also at Yate and District Heritage Centre. When scanned, the codes provide a link to a wealth of information and personal stories about people named on memorials in the churchyard, including the Parnall and Commonwealth Grave Memorials. The project has been coordinated by South Gloucestershire Council as part of a project supported by the Heritage Lottery Fund to engage local people with the centenary of WWI, which included working with schools and community groups. 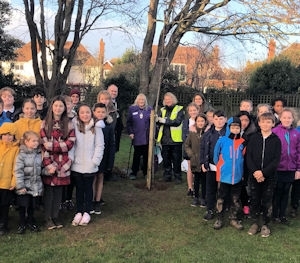 On 7 December Cllr Lindsay Freeman, deputy mayor of SEAFORD in East Sussex, visited Annecy Catholic Primary School to plant a memorial elm tree as part of the Elms for Armistice Project, which honours those who died in WWI. In total, 104 trees are being planted around Seaford and Bishopstone to remember the dead. Cllr Freeman was joined by acting head teacher Paul Gallagher, Year 6 students and the Seaford Tree Wardens. She thanked the children for attending and explained how the trees would be there for many years to come. Head boy Thomas and head girl Anna read out the names of the 104 soldiers, and each child took a turn to spread soil around the base of the tree. GODALMING Museum recently hosted an exhibition of work by artists from the Surrey town and its twin towns of Joigny in France and Mayen in Germany. Thirty works were specially created for “The Road to Peace” exhibition, which was inspired by the First World War. It explored themes of isolation, chaos and the confusion of war, but also the hope of the armistice of 1918. Nine local artists were represented. 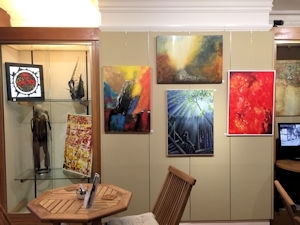 The exhibition was first displayed in Joigny in December 2018, before being shown in Godalming from 9 January to 2 March 2019. It has now moved on to Mayen. Cllr Liz Wheatley, president of the Godalming/Mayen Association, said: “This exhibition is a shining example of the collaboration and co-operation between the three towns and shows the benefit of twinning and the friendship that exists between us. AYLESBURY Town Council in Buckinghamshire installed a number of Royal British Legion (RBL) Silent Soldiers on a roundabout as part of its WWI commemorations. The “Tommy” silhouettes commemorated the young men from the town who died in the war, including Royal Flying Corps pilots who were based at RAF Halton. The mayor, Cllr Mark Willis, said: “We are proud to support the RBL’s ‘Thank You’ campaign, and to remember all of those who were involved in the war.”Also as part of the centenary commemorations, back in 2014 the council started a community wall hanging at the Flanders Field Event at the Bucks County Museum. White squares were decorated by children and members of the public with messages of remembrance and thanks, and tied together to create the hanging.Cllr Willis led a wreath laying ceremony at the war memorial on 9 November and the Remembrance service at St Mary’s Church on 11 November. This included readings by local cadets and members of the community, a short play and music by the Aylesbury Concert Band. 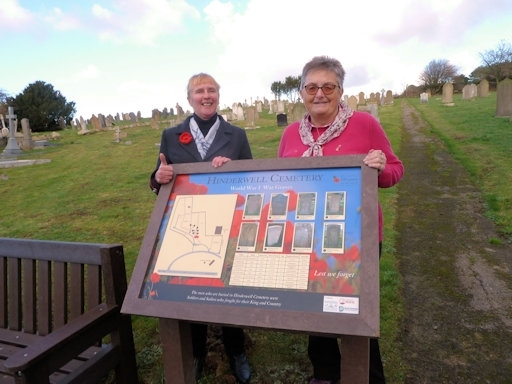 HINDERWELL Parish Council in North Yorkshire undertook two projects to commemorate the end of WWI. It installed an information lectern at the parish cemetery to assist visitors in locating its eight WWI graves and to give information on those buried there. The project was researched by clerk Carol Barker and her assistant Carol Barwick (pictured), and funded with grants from North York Moors National Park and North Yorkshire County Council. Secondly, the council worked with the Scarecrow Committee to purchase a striking “Soldier Seat”, using funds raised during the 2018 Scarecrow Festival. The seat has been installed on Hinderwell High Street. The parish of SCRIVEN in North Yorkshire always holds a Remembrance Day service at its village green and war memorial. The 2018 gathering included retired servicemen, cadets, parish and county councillors and parishioners and, for the first time, Marika, a 27-year-old pony who grazes on Scriven Green. According to Cllr Ivor Fox, chair of the parish council, residents thought it was very poignant to have a horse present at the service given the importance of horses and their contribution to WWI. For the occasion, Marika was adorned with purple poppies on her collar and tail. Thousands of residents attended the service of remembrance at the Memorial Gardens in THAME in Oxfordshire. A procession from the town hall was led by the RBL, Air Training Corps and Army Cadet Force, followed by local community groups. More than 50 wreaths were laid, and there was a ﬂypast from RAF Benson. Later in the day a beacon was lit at the Memorial Gardens, accompanied by performances and readings. 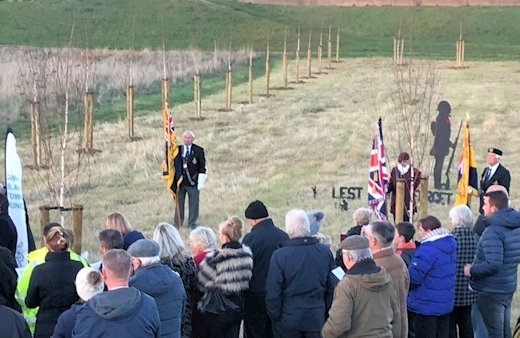 Among other events held to commemorate the centenary, Oxfordshire County Council partnered with The Woodland Trust to plant trees as a project of lasting remembrance. Thame was given an oak sapling and a commemorative plaque, and on 9 November the mayor, Cllr Ann Midwinter, planted this on the boundary of Cuttle Brook Nature Reserve. 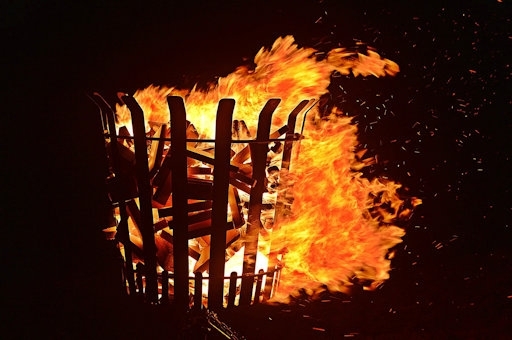 SEVENOAKS Town Council in Kent held a procession and a beacon lighting ceremony at the Vine Gardens on 11 November. It also made a grant to assist the publication of a poignant book written by local historian Matt Ball about how the town was affected by the Great War. 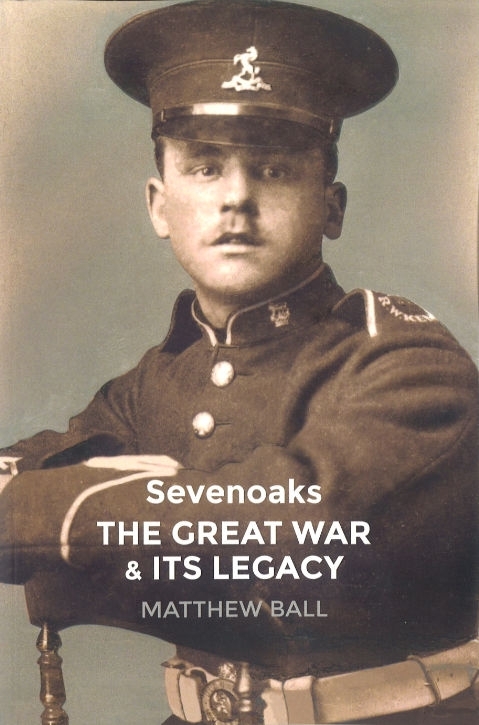 The book, Sevenoaks: The Great War & Its Legacy, tells the stories of soldiers billeted in and around the town, Belgian refugees, wounded soldiers and the women who nursed them and took on many other roles during the conﬂict. 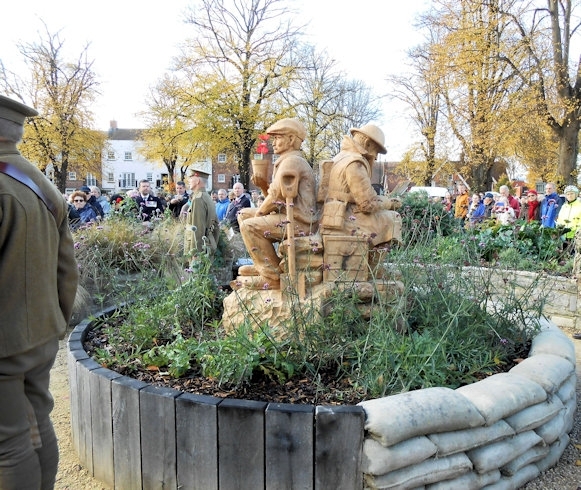 CHICHESTER City Council in West Sussex unveiled a wooden sculpture in Litten Gardens at its Remembrance Sunday service. The oak tree used for the sculpture was over 100 years old and had fallen on a nearby allotment in 2017. The trunk was transported to the Woodland Centre in West Hoathly, which specialises in chainsaw sculptures. The piece does not depict a particular individual but inspiration was taken from a soldier of the 4th Royal Sussex Regiment. The two sides of the sculpture show the same character, one in civilian life and the other representing his life in the trenches. 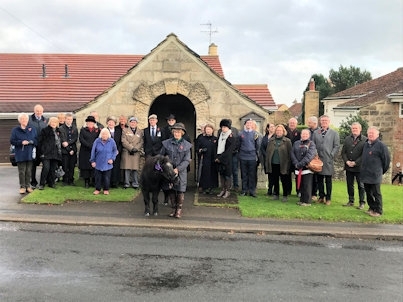 BRADFIELD Parish Council in South Yorkshire marked the centenary by planting English oak trees and installing memorial benches in Coronation Park, Oughtibridge, the park at Dungworth Green and a picnic area in Low Bradfield. Councillors, members of the Royal British Legion and representatives of other local councils and Sheffield City Council, the Peak District National Park and South Yorkshire Police attended the ceremonies, and children from local primary schools read out the names of the fallen. NEWBURY in Berkshire decorated its war memorial with a “River of Poppies” knitted and crocheted by members of the Newbury Trefoil Guild. The mayor, Cllr Margo Payne, took the salute at the parade before a service of remembrance in the Market Place and the laying of wreaths. A number of other events also took place, including the lighting of a Battle’s Over beacon and a final showing of the WWI in Newbury Exhibition 2018, which was held in the council chamber at the town hall from 9–18 November. A series of talks was also held at the town hall on topics such as the Western Front, the 1918 Spring Offensive, life in Newbury during the war years and the work of the Commonwealth War Graves Commission. STOCKSBRIDGE Town Council in South Yorkshire staged a poppy project display in the Clocktower Gardens to mark the centenary. The whole community, from schools to local groups and individuals, contributed poppies, whether knitted, crocheted or made of felt, plastic or metal. Illuminated figures of soldiers were placed on the Clocktower and will remain there permanently, while an illuminated poppy was placed on the town hall balcony for a two-week period. WORKINGTON Town Council in Cumbria organised two parades, one in Harrington and one in Workington itself. The Workington parade processed to Vulcan Park for a service at the Cenotaph, before a church service featuring performances and readings by children from a local junior school. The Last Post was then played in Vulcan Park before the lighting of a beacon at 7pm as part of Battle’s Over. This national campaign aimed to light 1,000 beacons across the UK to symbolise the “light of hope” that emerged from the darkness of war. The town of TROWBRIDGE in Wiltshire was decorated with hundreds of woollen poppies knitted by individuals and local organisations. Some of the poppies will be donated to the charity Combat Stress, while the remainder will be used for future commemorations. The Trowbridge branch of Shaws The Drapers, which donated the wool, held a “Knit and Natter” session with the support of the town council’s information team. Those trying their hand included the mayor, Cllr Dennis Drewett. SELBY Town Council in North Yorkshire worked with the Royal British Legion and Selby Abbey to host three major events to commemorate the end of WWI: a schools service at the Commonwealth Grave section in Selby Cemetery, a Remembrance Festival featuring the Carlton Main Frickley Colliery Band at the Abbey and the annual Remembrance service. The mayor of GODALMING in Surrey, Cllr Nick Williams, officially opened the town’s new Memorial Garden on 10 November. Based on an idea from Cllr David Hunter, the garden was built in the Victorian Nightingale Road Cemetery over the summer by the Godalming Joint Burial Committee. It honours the 281 local men who died in the Great War, together with all those in the community who were affected by the conﬂict. On Remembrance Sunday, over 1,500 residents gathered at the town’s war memorial for a service. Cllr Williams and other dignitaries were joined by representatives of the Armed Forces, service veterans, the emergency services, cadet forces, scouts, guides and other youth organisations in a procession led by Godalming Band. Commemorations in WHITWORTH in Lancashire saw a record turnout for a procession to the Memorial Gardens led by the Whitworth Vale and Healey Brass Band and a Service of Remembrance at the Cenotaph led by the mayor’s chaplain, Rev Father Chris McGrane. A two-minute silence was observed and wreaths were laid, with refreshments served afterwards at the Civic Hall. During the service a presentation was made to Dave Tattersall, principal cornet with the band, who has played the Last Post on Remembrance Sunday for 40 years. Two acer trees were planted by Whitworth Horticultural Society in memory of those who fought in both world wars. Events extended over the whole weekend, including a sell-out show, Pack Up Your Troubles, at the Riverside and a WWI-themed café at St Bartholomew’s Church. A beacon was also lit as part of the national Battle’s Over tribute. SAXILBY WITH INGELBY Parish Council in Lincolnshire purchased ten “There But Not There” Tommy silhouettes, using grant funding from the Armed Forces Covenant Fund Trust. The silhouettes were placed under the five roll of honour boards around the parish to act as a permanent reminder of the 59 local men who did not return home. 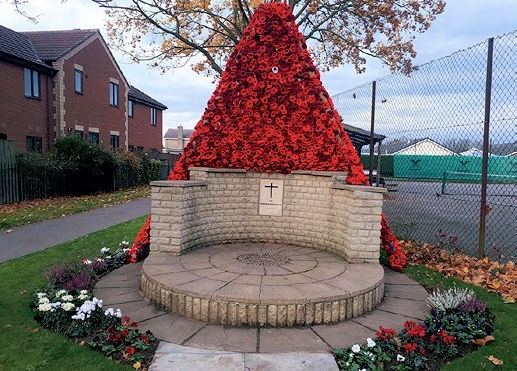 Residents contributed in many ways, including knitting over 2,000 poppies, which formed a cascade over the village war memorial. A Remembrance service was held at the newly landscaped Memorial Garden on 10 November and local organisations, civilians and ex-Armed Forces personnel were invited to a Peace Party afterwards. A working group of residents, clergy and councillors also organised a series of small events and displays to mark the centenary. These included two 6ft Tommies painted on the doors of the village hall, two 4ft Tommies elsewhere in the village and poppy swags over the roll of honour boards. Poppies made by the Saxilby Scouts were installed on the Memorial Gates. CANVEY ISLAND Town Council in Essex, working in partnership with the parish, planted 47 trees to honour the local men who died in WWI. The project will create a lasting memorial and was funded by donations from the community and grant funding from the Rotary Club and the town council. The trees were planted around a wildﬂower meadow at Tewkes Creek, and an obelisk will be placed in the centre. 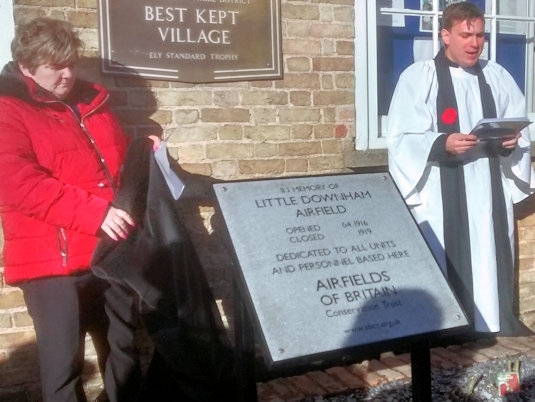 After the church Remembrance Service and wreath laying at the war memorial on 11 November, Cllr Jo Waters, chairman of LITTLE DOWNHAM Parish Council in Cambridgeshire, unveiled a granite memorial plaque outside the village hall to commemorate Little Downham Airfield and the units based there during the Great War. The airfield was used by the Royal Air Force and Royal Flying Corps from April 1916 to March 1919. The plaque was donated by the Airfields of Britain Conservation Trust (ABCT), whose founder, Kenneth Bannerman, approached the council. The Trust had been awarded funds to provide 100 granite markers for old airfields around Britain by the centenary of the end of WWI. It has since exceeded its aim and has donated 140 markers to date. 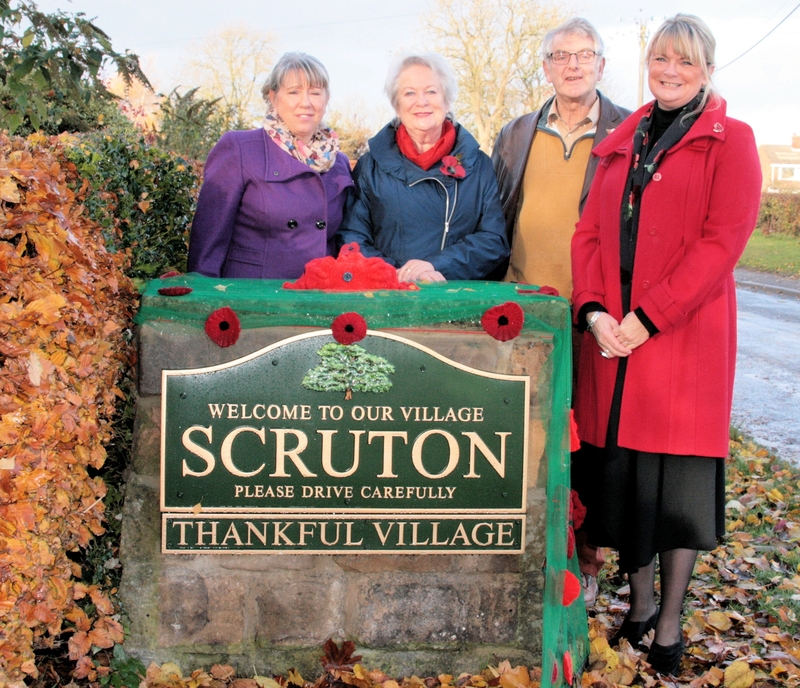 SCRUTON Parish Council in North Yorkshire commissioned a new village sign to mark the centenary and the village’s designation as a Thankful Village – one where all those who left to fight survived the conﬂict. For the Remembrance weekend the sign and its plinth were decorated with poppies by Marion Largent, accompanied by parish council chair Cllr Janet Crampton, Cllr Tony Wood and Cllr Annabel Wilkinson of North Yorkshire County Council. A second sign will be commissioned at the north end of the village to complete the project. Hundreds turned out in NEW MILTON in Hampshire for a parade led by the Meridian Corps of Drums marching band and the laying of over 50 wreaths at the war memorial. Eighty-three local servicemen lost their lives in the conﬂict, three of them in November 1918, and particular emphasis was given to their sacrifice. The town clerk, Graham Flexman, invited representatives from local businesses, charities, community groups, schools, uniformed services and the young people of the town to lay wreaths following the Last Post and The Exhortation read by Brigadier Paul Jepson, president of the New Milton Royal British Legion, followed by Reveille and the Kohima Epitaph. A packed Remembrance Service was held at New Milton Memorial Hall, including music and recitations by school students. In the afternoon the mayor, Cllr David Rice-Mundy, laid a wreath at the Indian Memorial Obelisk in Barton on Sea, which honours Indian troops who convalesced there. In the evening thousands attended a parade and a beacon-lighting ceremony on the cliff top as part of Battle’s Over – A Nation’s Tribute, the nationwide commemoration in which over 1,000 beacons were lit across Britain. In RAYNE in Essex, villagers set up a Commemoration Committee to organise centenary events. 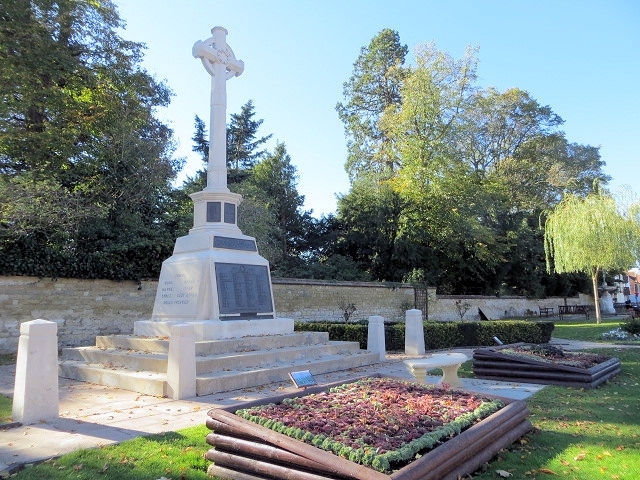 The war memorial was restored over the summer using a grant from the War Memorials Trust, and over 30 poppies and information sheets were displayed outside the homes of men who enlisted and never returned. A large stone was transported from Verberie in northern France, with which Rayne is twinned, to mark the spot where servicemen enlisted in 1914. 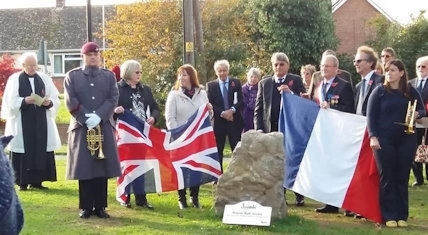 The stone and a plaque were placed on the village’s Centenary Field and on 3 November were unveiled by Jacinta Smith and parish council vice-chair Ann Hooks, both descendants of servicemen named on the war memorial, and the mayor of Verberie. 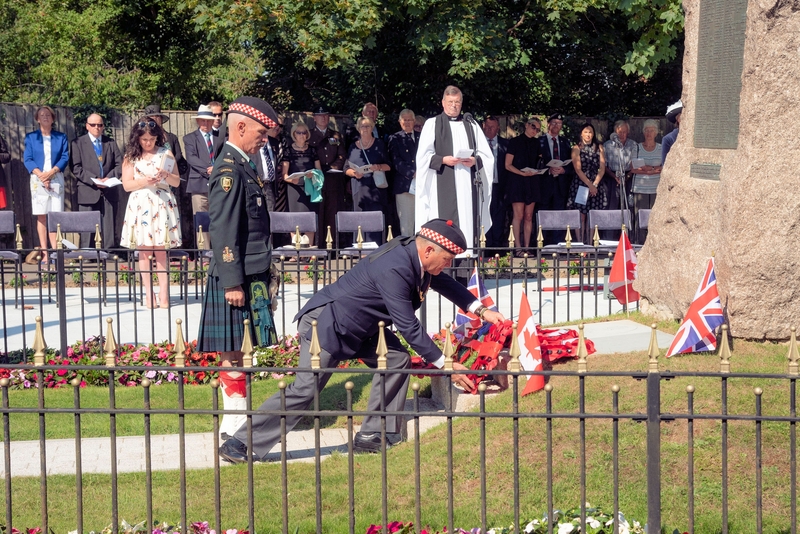 Dignitaries from Verberie, together with MP James Cleverly, members of the RBL and other guests, attended the unveiling and rededication of the war memorial, followed by a church service. On 10 November, a pop-up museum displayed a WWI project by local children. The Remembrance service took place on 11 November and included a two-minute silence and wreath laying by community groups, along with clay poppies made by the local Cubs. In BICESTER in Oxfordshire, the grounds of St Edburg’s Church were packed for a service to commemorate Armistice Day, attended by many local dignitaries. It began with a call to attention, then a lone bugler played the Last Post to signal two minutes’ silence. Afterwards wreaths were laid on the war memorial, followed by a church service during which thousands of red poppies were dropped from the bell tower in an act of remembrance. Family members of those who lost their lives in WWI joined serving soldiers, veterans, the RBL and representatives from local groups and organisations to march through the town, with the mayor, Cllr Sean Gaul, taking the salute. The parade was led by the 2507 ATC Squadron Band, with crowds of spectators six deep in places. The community of WOOTTON in Bedfordshire created a commemorative WWI display at the entrance to the village to honour those who served. 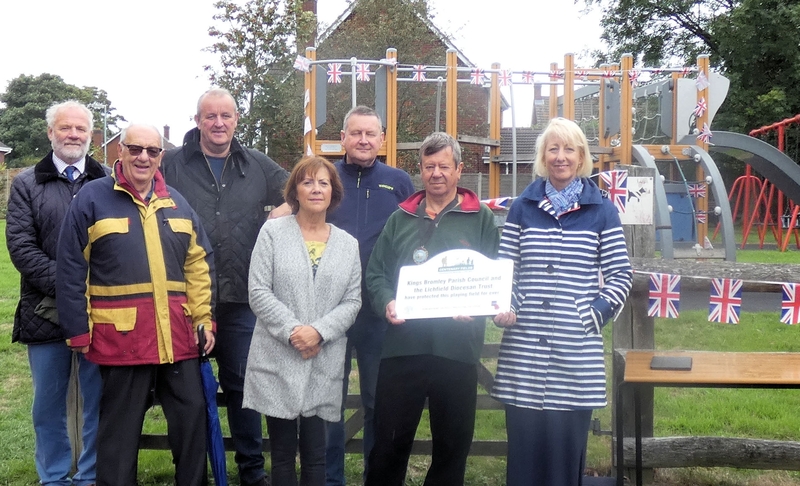 The project was the idea of parish council chairman Cllr Gareth Lloyd, who was supported by his colleagues and by Wootton borough councillor John Wheeler, who helped with the build. The council first sourced 800 sandbags, donated by construction companies working on projects in the village. It then purchased a Silent Soldier silhouette from the RBL, and Wootton Upper School designed two Silhouette Field Guns, which were placed behind the sandbag wall. Families and children made poppies to add to the display, and Wootton WI and Acorn Quilters held a drop-in day on 10 November to create indoor and outdoor poppy waterfalls at the Memorial Hall. The display will remain in place until November 2019. Cllr Wheeler said: “The whole community has come together to build a truly fitting tribute. We would like to say a big thank you to all the community groups for their amazing contributions. 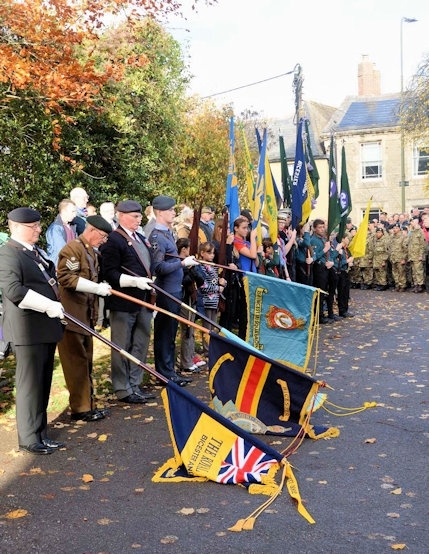 WARMINSTER in Wiltshire held its annual Remembrance Service and parade on 11 November. 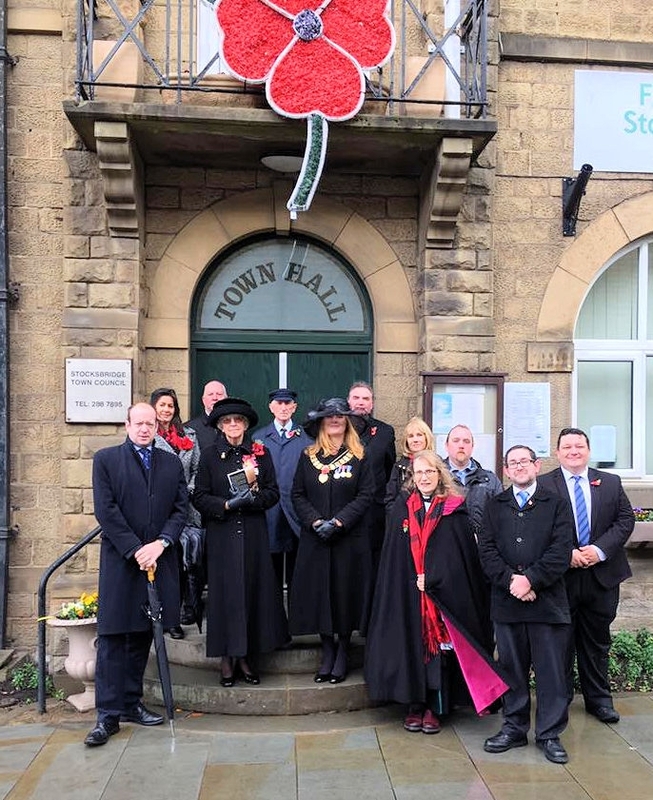 The Remembrance period was marked with a display of poppies throughout the town, including a poppy cascade at the Chapel of St Lawrence created by British Legion Poppy Appeal organiser Lesley Fudge and a team of supporters. 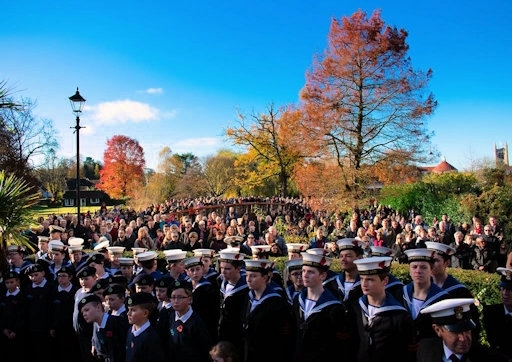 Large crowds gathered in FARNHAM in Surrey for the Remembrance service on 11 November. A 450-strong procession marched from the site of the world’s first ever two-minute silence held in Castle Street in May 1916 to the war memorial at Gostrey Meadow, with music played by the Alder Valley Brass Band. The ceremony was organised by the town council and the RBL, and the war memorial guard of honour comprised female cadets from each of the services. One of the oldest veterans on parade, Percy Bartlett (95), read the Kohima Epitaph. After the ceremony, a service was held at St Andrew’s Church, with a march past and salute taken in front of the town council offices. 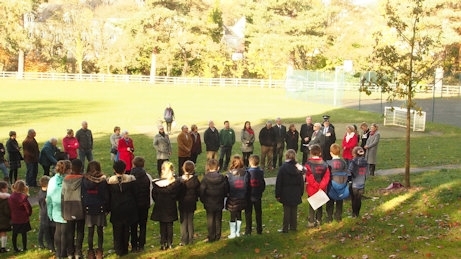 On 9 November a special act of remembrance for schools was held at the war memorial, attended by children from 18 local schools. Sea cadets marched to the war memorial, joined by members of the RBL and the 4th Battalion of the Princess of Wales’ Royal Regiment, and were welcomed by the mayor, Cllr David Attfield, and other dignitaries. Children read war poems they had written before a two-minute silence, followed by the Last Post and Reveille. 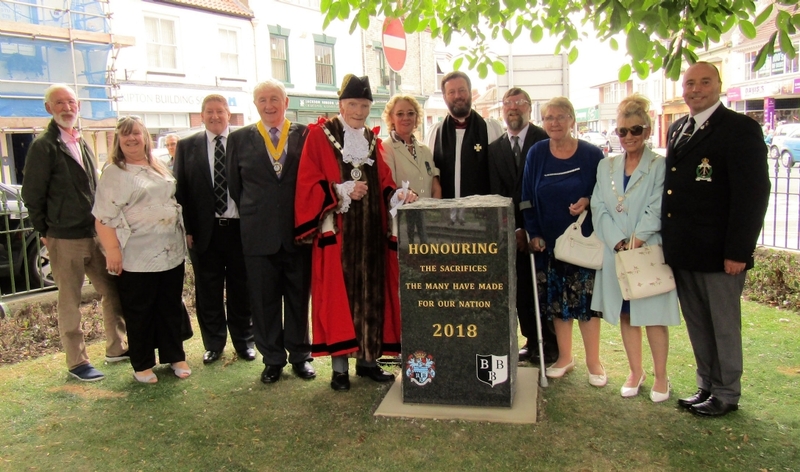 BRIDLINGTON in East Yorkshire unveiled a Memorial Stone in its War Memorial Gardens in August, with a service attended by many local organisations. The stone honours the sacrifices made by many servicemen and women and also non-uniform war efforts like those of people who worked in munitions factories and farmers who continued to grow food. According to clerk Paula King, the project has been a good example of partnership working between the public and voluntary sectors, involving the town council, the Lords Feoffees of the Manor of Bridlington and the East Riding of Yorkshire Council. The town council has also produced special commemorative coins to mark the centenary of the end of WWI, which it will distribute to primary school children. The coins have been designed in a similar style to the hexagonal peace celebration medals that were presented to children in 1919. A ceremony was held at HAYWARDS HEATH War Memorial on 2 September to commemorate the 100th anniversary of Sgt Arthur George Knight winning the Victoria Cross. Sgt Knight was born in the Mid Sussex town and, as part of a nationwide initiative to commemorate all VC winners, a special stone was unveiled in his honour. He died from wounds the day after the action that gained him the VC. The service was organised by the town council and Mid Sussex District Council, and was led by the mayor, Cllr James Knight, and district chairman Cllr Bruce Forbes. It was attended by numerous dignitaries, including Sir Nicholas Soames MP, and included the laying a wreath by children from Sgt Knight’s old school. SEAFORD in East Sussex is planting 104 disease-resistant elm trees to remember its 104 WWI war dead, in an initiative called Elms for Armistice. The council has called for volunteers to assist its tree wardens and local conservation groups with the task. The trees are planned to be a lasting memorial. Elms have been chosen as the county has the UK’s largest collection of surviving mature elms. They are also a vital habitat for the endangered white-letter hairstreak butterﬂy, colonies of which still survive locally. 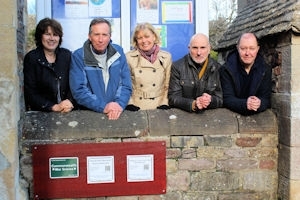 RODBOROUGH Parish Council in Gloucestershire has spent four years researching the identities of 60 men named on its WWI memorial and has funded the production of a commemorative book, six copies of which will be available as a public resource. With the collaboration of the Five Valleys Great War Researchers group, the project tells the story of a community and ordinary individuals changed by war. The 240-page, A4-size book is illustrated with black-and white photos, and extra copies are available to purchase. A collaborative exhibition, “The Stroud Valleys in the Great War”, will be held at the Museum in the Park from 3–11 November. As a further tribute, the council has had the war memorial tablet in the local church cleaned. It paid for the work partly through a fundraising event in April, a theatre production of Tommy Atkins and the Canary Girl, a powerful drama viewing the war through the eyes of a local couple. KINGS BROMLEY Parish Council in Staffordshire, along with the Lichfield Diocesan Trust and the National Playing Fields Association, has drawn up a deed of dedication to secure a local playing field as a Centenary Field in Trust, which means it can never be used for any other purpose. 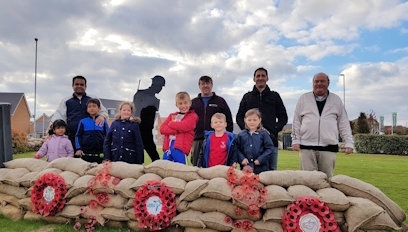 The Centenary Fields initiative, in partnership with the Royal British Legion, secures recreational spaces throughout the UK in perpetuity to honour the memory of those who lost their lives in WWI. The dedication ceremony, at 11am on 11 September, was attended by Angela Lewis of the Fields in Trust organisation. GODALMING Town Council in Surrey and Godalming Museum held a WWI exhibition that ran until 13 October and commemorated the 281 local men who gave their lives during the Great War. The council and museum have been researching their histories since 2014. The exhibition used archive materials to explore their lives and the impact of the war on local families, and invited visitors to explore the Roll of Honour. On Remembrance Sunday, the Godalming War Memorial will be re-dedicated to remember all those who died in 20th century conﬂicts. The town council has had all 281 names from WWI and subsequent campaigns engraved on four new plaques, funded by public subscriptions and the Peter Caudle Memorial Trust. The mayor of LLANELLI in Carmarthenshire hosted a two-day event in the council chamber in June as part of the Great Pilgrimage 90 (GP90) project with the Royal British Legion, which marked 90 years since veterans and war widows visited the battlefields of the Somme and Ypres. Eight schools took part in the project and a poem was drafted for a wreath that was laid at the Menin Gate in August. Llanelli Youth Theatre is staging seven performances of Oh! What a Lovely War in November, and two weeks of activity will also include a poppy art class and community exhibition. A seniors group is working with the RBL to knit poppies for the commemoration, and 12 silhouettes signifying lost soldiers will be displayed in and around Llanelli in the lead-up to 11 November. CARMARTHEN Town Council meanwhile will be participating in the commemoration by holding a ceremony to light a beacon in the town centre on 11 November, at 7pm. 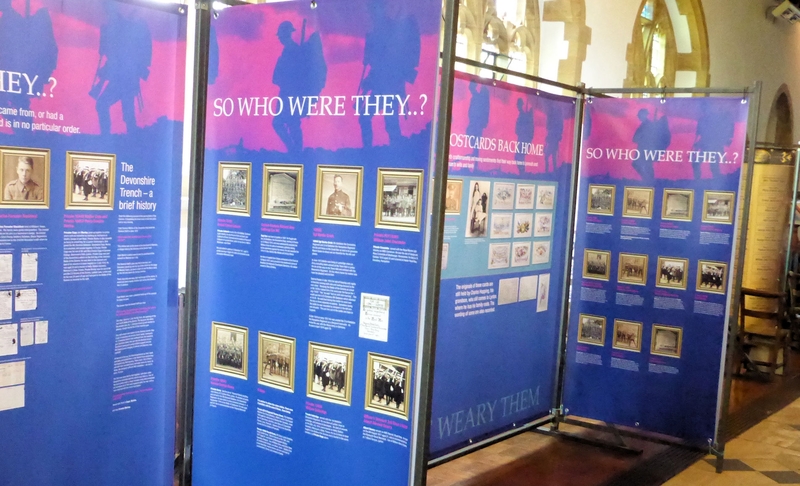 LYNTON AND LYNMOUTH in Devon staged a WWI exhibition at St Mary the Virgin church in Lynton over the summer, profiling all those who fought and died and whose names are recorded on the war memorial, with a brief family history. Volunteers raised money to clean the three memorials in the twin towns, renovate the Lynton War Roll of Honour and fund a community celebration. This will feature a 25-metre “poppy banner” draped across the town hall and an eight-metre painted depiction of the trenches by volunteer local artists. The event will include a parade and a special service where the Roll of Honour will be represented to the community. This will be followed by a free community meal at the town hall with games and entertainment, then a mufﬂed peal, cannon salute and lighting of the RBL beacon. Any surplus funds will be donated to armed forces charities. FROME in Somerset, like many other communities, will be observing the Annual Act of Remembrance, which falls exactly 100 years after the Armistice was declared at the eleventh hour on 11 November 1918. Wreaths will be laid in memory of the fallen, and also to mark the centenary of local regiments and of the RAF. Many other events are being held in the town and surrounding villages. They include an exhibition looking at the effects of the war on the local population at Frome Heritage Museum; a staging of the play A Journey’s End at the Merlin Theatre; and the unveiling of a new war memorial in St Mary the Virgin Church in Upton Scudamore. Perspex silhouettes will stand in many public venues to honour the fallen and knitted poppies and wooden crosses will also recall the 224 local men who died. There will be a Garden of Remembrance in the foyer of the Frome Memorial Theatre, with a daily roll call of names, among other events. A number of women connected with YATE Town Council have been recognised in South Gloucestershire Council’s “Inspiring Women” Project, funded by the Heritage Lottery Fund, about the legacy of WWI in the area. The project includes women who have made significant contributions to local politics or to public service and industry over the past 100 years, and features an exhibition that will run at Yate Library for most of December. Among those recognised are past and present Yate town councillors Margaret Bracey, Mary Draper, Gladys Nelson and Cllrs Sue Walker and Chris Willmore. Also honoured is former town clerk Susan Tubey. Cllr John Ford, the current mayor, said: “I am so pleased that these women who have contributed so much to making Yate an open and inclusive society are getting due public recognition after so much dedication to our town. NEW MILTON Town Council in Hampshire has undertaken a series of initiatives, including a “Pack Up Your Troubles” concert on 3 November. 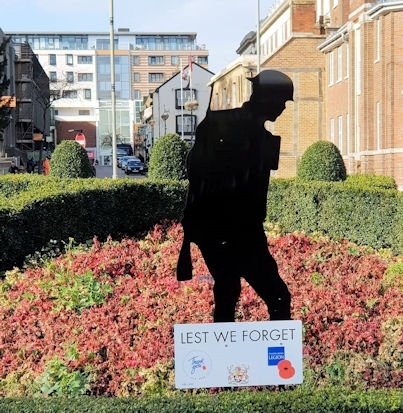 There has been enthusiastic support for the RBL Silent Soldier Silhouettes campaign, with community donations enabling the council to install 18 silhouettes around the town. Back in July, a commemorative event was held at the town’s Indian Army Obelisk. The monument is one of only two freestanding Indian Army memorials in Britain, and was recently re-designated with a Grade II listing. 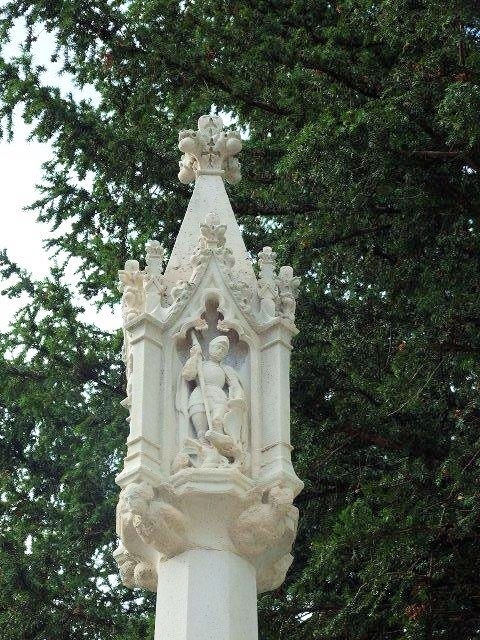 It was funded by donations from staff at the Barton Convalescent Hospital, and was erected on 10 July 1917. The council has installed a historical information board, which was unveiled by the Indian Deputy High Commissioner. MOLD Town Council is hosting a Commemorative Concert at Theatr Clwyd on the evening of 11 November. The concert will include music and dance from the decades following WWI right up to the modern day, with performances from Flint Male Voice Choir and the Good Night Sweethearts, tributes to Frank Sinatra and the Rat Pack, an RAF Cadet Band and a Beatles tribute band, among others. The event will pay tribute to soldiers from Mold and the surrounding villages who lost their lives in the conﬂict, and will support the Royal British Legion’s “ThankYou100” campaign, which thanks all those who fought and lived through WWI. Tickets cost £20, with proceeds going to the RBL and the mayor’s appeal. NEWBURY Town Council in Berkshire has given its war memorial a deep clean in preparation for this year’s Remembrance Day parade and the national “Battle’s Over” tribute, which will see the lighting of a beacon as part of a nationwide commemoration. The brass plaques listing all those who died in WWI and WWII have been polished by a specialist contractor, the stonework has been cleaned using a super-heated water treatment system and the black and gold railings have been repainted. The council’s World Wars Working Group has organised a number of events in November, including a series of evening lectures and a WWI exhibition, which will run at the town hall from 9–19 November. WARMINSTER Town Council in Wiltshire has purchased three RBL “Thank You” silhouettes, one representing each of the three services. They have been positioned outside the Civic Centre and will be moved to the war memorial for the remembrance service on 11 November. The town’s commemorations also included a “Warminster War Facts Trail” in late October. This involved children filling in missing words on an entry form containing 100 facts about WWI by following a trail around the town. The trail covered a range of topics from the part played by women and children in the war to the role of various local buildings. Twenty venues in the town centre participated, and the first prize was two tickets to an evening of music and entertainment, “In Flanders Fields”. BICESTER Town Council in Oxfordshire has invited the families of those who lost their lives or served in WWI to join the Remembrance Day parade in their honour. Hundreds of serving soldiers will join veterans, the Royal British Legion and representatives from local organisations to march through the town. 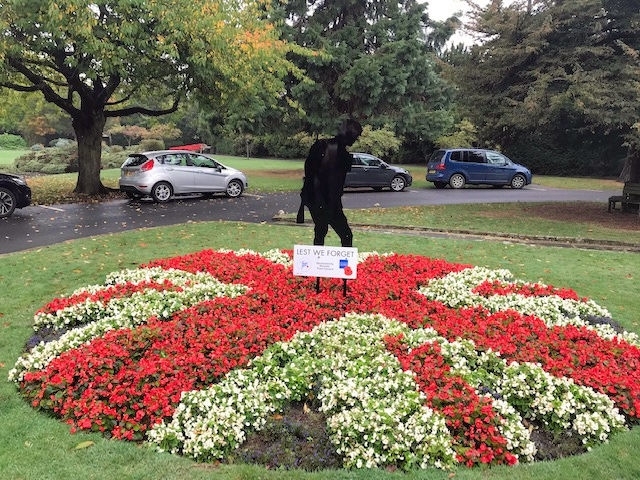 As part of its Act of Remembrance, the council has installed three “Silent Soldier” silhouettes – a naval rating, an airman and a “Tommy” infantryman – in Garth Park. A further six silhouettes have been ordered from the RBL, and these will be placed in the churchyard at St Edburg’s Church ready for Remembrance Sunday. Wreaths will be laid on the war memorial, and thousands of red poppies will fall from the bell tower following a church service. SWANLEY Town Council in Kent has received a £9,700 grant from the Heritage Lottery Fund for a project to mark the centenary. Schoolchildren will carry out research to identify all the fallen who lived in the town, recording their names, regimental numbers, the date they died and any supporting information. This will then be engraved onto steel silhouettes and mounted on a wall in the town centre. It is estimated that around 120 steel silhouettes will be needed, and that they should last another 100 years to act as a constant reminder. Each costs £200 to create; local businesses have been very supportive but organisers are still looking for a number of sponsors in time for the unveiling. FIELDS IN TRUST, the charity that protects the country’s green spaces, launched its Centenary Fields commemorative programme on 8 August. Every day at 11am until the anniversary of Armistice Day on 11 November, it is revealing the story of one Centenary Field in an online interactive map. At the conclusion of the programme, communities across the UK will demonstrate their gratitude to the WWI generation with a series of events and activities on these legally protected parks and green spaces. The Centenary Fields Legacy campaign is being delivered in partnership with the Royal British Legion (RBL)’s “Thank You” project. It will highlight the stories of individual combatants and civilians, feature memorials to the fallen and will explore how parks and green spaces served the war effort – for example, providing timber for trenches. It will also protect parks and green spaces with a connection to WWI in perpetuity. 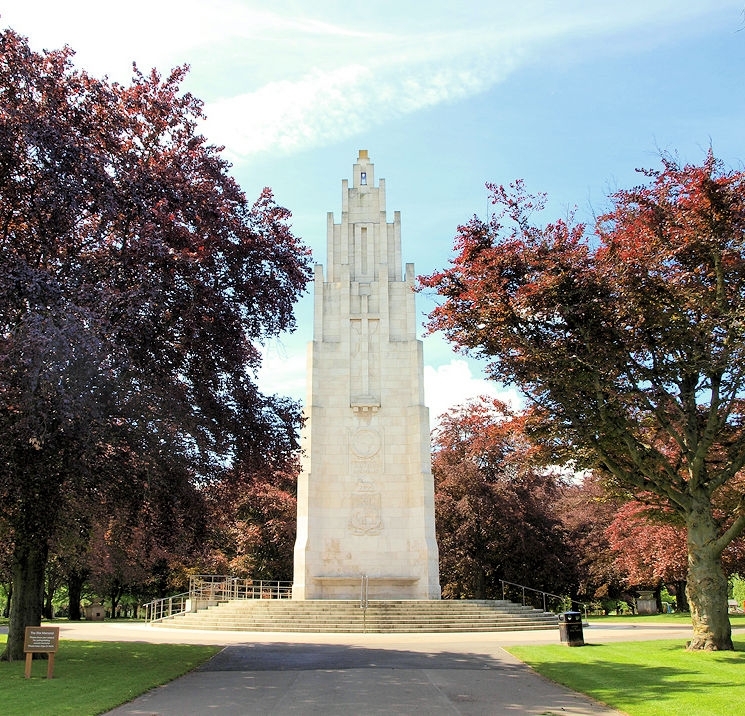 The first space to be featured was the War Memorial Park in COVENTRY (pictured), a 120-acre site where Centenary Fields was launched in July 2014 by the charity’s president, HRH the Duke of Cambridge. 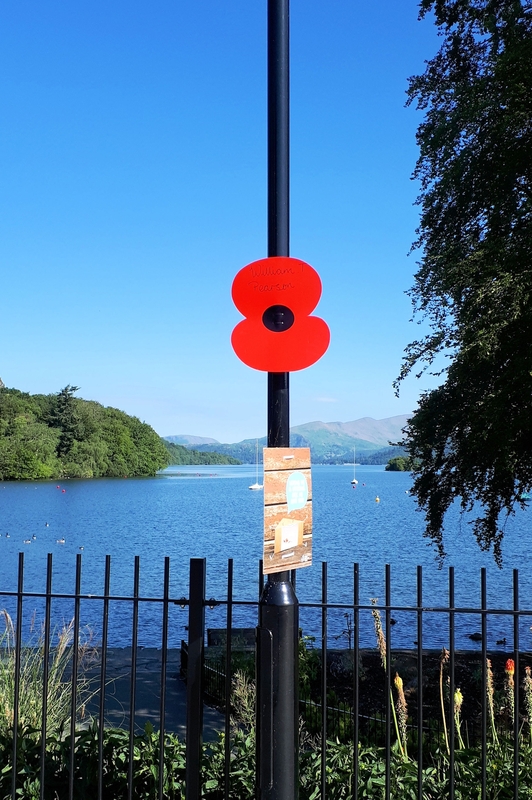 Lamp posts in WINDERMERE AND BOWNESS in the Lake District have been decorated with poppies, each representing one of over 130 young men who died in the conﬂict. The idea came originally from Simone Backhouse of Bowness & Windermere Community Care Trust. She contacted the Royal British Legion, who supplied the poppies, and Windermere Town Council, which provided grant funding and support. Cumbria County Council also supported the project. The poppies will remain in place until the end of November and businesses, churches and households are invited to photograph them and share the soldiers' names on social media.